The Empire State Aerosciences Museum has the opportunity to aquire a half scale replica of the British Airways Supersonic Transport Concorde. The same Concorde displayed in New York City Times Square. The 100 foot long replica is in Long Island, NY and ESAM needs to raise money to transport the aircraft 200 miles to the museum location in Glenville, NY. It's expected to take five trips as the aircraft is disassembled at this point in time. Once this arrives in Glenville it will be restored and displayed in front of the museum's main hangar. 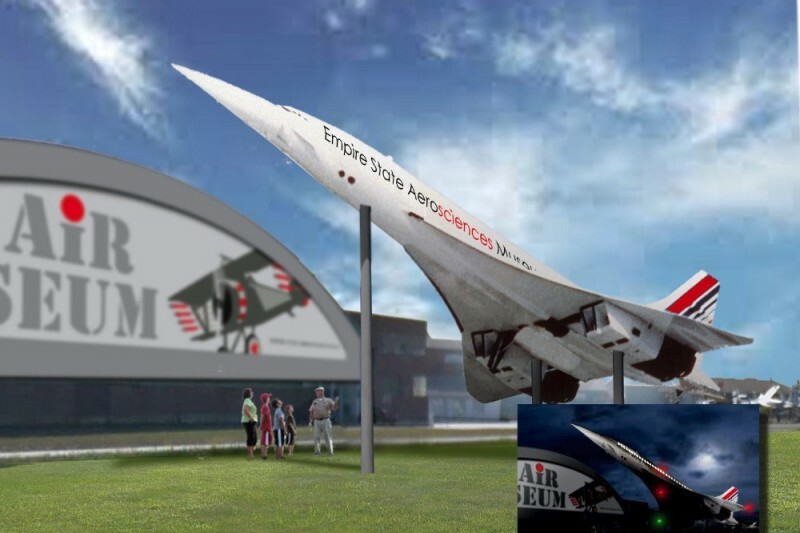 The attached photo is a rendering of what the front of the museum is expected to look like after the Concorde is restored and displayed. Your help and support with this project is extremely appreciated. 2/24/2019 Update - The Concorde is being assembled and painted. Once the ground thaws out, the construction of the base and stand will start. Donations are still needed for the concrete, steel, labor and cranes. The Concorde was taken apart and hauled up to ESAM at the Schenectady Airport. The 100ft replica now has to be assembled and painted. Funds are still needed as the hauling was more expensive and we have not meet our fundraising goal. For donations over $199, you will receive a one year membership free. Membership includes unlimited visits to the museum, a year subscription to our newsletter and special invites to events! ESAM has approximatly 40% of the Concorde ( wing tips, vertical fin and 33 feet of the nose section ) The "heavy" parts (center wing including the engine nacelles and the remaining 68 feet of fuselage remain). transportation being the issue. We expect 4 to 5 more truck trips aqt approximately $2000 per trip ! That should complete Phase 1 ! I was a Charter Member of the ESAM Board of Directors, with Ernie Tetrault, Steve Israel, Carl Battaglia, Bob Boroughs and others. I miss the Air Shows and the Blue Angels! In memory of Bob Posson and Fran Hopper. Jim , will donate more at another time . Hope this helps till then. My uncle always used the concord when traveling to Europe in business . Peter n I worked for the airlines also . Hope this plane gets to where it belongs , with other history !